The Document Foundation has unveiled LibreOffice 5.3 64-bit and LibreOffice 5.3 32-bit. Despite the point update, LibreOffice 5.3 is billed as "one of the most feature-rich releases in the history of the office suite", and is packed full of major changes affecting all parts of the application. Highlights include a new experimental (and optional) ribbon-based UI, plus a new cross-platform text layout engine. 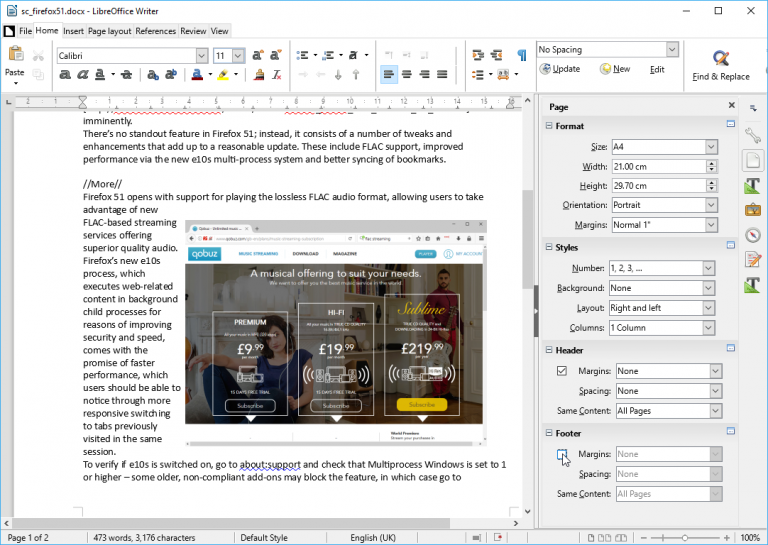 It’s also accompanied by the first source release of LibreOffice Online, for basic collaborative document editing in a browser. A new text layout engine opens the list of notable new suite-wide features. This is a cross-platform engine that supports OpenType and Graphite Layout on all platforms, providing a consistent text layout on whatever machine LibreOffice is run on. The new engine is more flexible, supporting a wider range of scripts and languages, including vertical "left-to-right" block direction. LibreOffice 5.3 also implements a new color palette system with changes to the workflow (including improvements to how recent colors are handled), a reduced set of palettes and support for introducing new color palettes via extensions. Other core improvements include a new Safe mode, allowing LibreOffice to be launched with a clean user profile should problems be encountered with an add-on or corrupt setting. Trigger it via Help > Restart in Safe Mode… or the -safe-mode command line switch (Windows users also gain a Start menu shortcut). Users also gain the ability to embed PDF into documents as images, while the drawing tools for arrows have been extended from both Draw and Impress to Writer and Calc. Keyboard shortcuts now appear in context menus (toggle this on and off via Tools > Options > View > Menu), and the document recovery dialog has been simplified. New Media Playback and Page Decks have been added to the sidebar in Writer, the latter comprising four panels: Page Format Panel, Styles Panel, Header Panel and Footer Panel. The Area Content Panel gains an Import Bitmap option, while the Styles & Formatting Sidebar Deck gains a "Show Previews" option for previewing styles. Writer users can now quickly move between pages via [Ctrl] + [G] or Edit > Go to Page. Table styles have also been implemented. Borderless padding is now displayed and the Navigator has been improved to allow multiple heading selection for promoting or demoting their levels -- toggle "Content Navigation View" and use [Shift] or [Ctrl] to do so. Wildcards in formulas are now enabled by default in Calc, and Median has been added to the list of functions in Pivot tables. Users can now also merge non-empty cells via Format > Merge Cells > Merge Cells. Impress users gain a new Template Selector (and two new templates: Vivid and Pencil), while the underlying Firebird SQL database connector for Base has been upgraded to version 3.0 -- be warned, this version is not backwards compatible (compatibility is promised for a future version of Firebird) so some databases may stop working in LibreOffice 5.3. A workaround is provided on the release notes page. The new ribbon-based UI, referred to as a Notebookbar, is still an experimental feature, and so must be made visible via Tools > Options > LibreOffice > Advanced. Tick "Enable experimental features (may be unstable)" and upon restarting the UI becomes accessible via View > Toolbar Layout > Notebookbar. At the present time, the feature -- codenamed MUFFIN -- is still relatively sparse, although users have a choice of three basic styles: tabbed offers the closest approximation to Microsoft Office, with contextual groups and contextual single options also available. These changes scratch the surface of what’s been implemented in LibreOffice 5.3 -- check out the extensive release notes for a full rundown. LibreOffice Productivity Suite 5.3 64-bit is available now as a free, open-source download for Windows, Mac and Linux. LibreOffice Productivity Suite 5.3 32-bit is also available for 32-bit Windows and Linux machines.